The building was arranged in four bars to reduce its scale and help it fit in with the older, smaller buildings on campus. The newest building on campus at University of Puget Sound is one you may think has always been there. It’s called Weyerhaeuser Hall, and it houses five departments in the physiological and behavioral sciences that were previously dispersed throughout the campus. 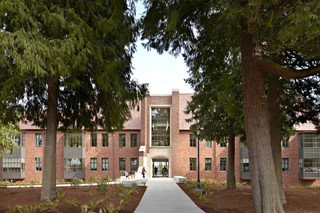 Built of brick and stone along a large grove of mature cedar and fir trees, the four-story 42,500-square-foot building brings together students, faculty and researchers studying health science. The university wished to build a state-of-the-art science building that would fit seamlessly with the traditional Tudor Gothic architecture found on campus. It also needed to embrace the principles of “universal design” to accommodate all people, including special needs. The building was designed by the Seattle office of Bohlin Cywinski Jackson. The design team strove to reflect the best qualities of the Tudor Gothic, while bringing contemporary qualities of light, natural ventilation and views into the interior. “It’s both sensible and emotionally appealing,” says principal Peter Bohlin. Across American universities, leading-edge facilities are being built to attract the best students, faculty and researchers. Enabling students to work with actual patients and other departments, as well as foremost experts in industry, reflects a new way of thinking about cross disciplinary academic collaboration. 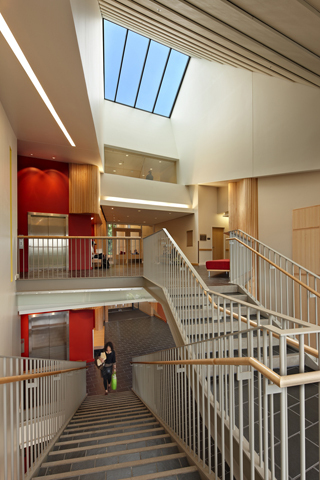 The University of Puget Sound wanted a building that could make these interactions possible. The heart of the building is a sky-lit atrium with a dramatic stair. Weyerhaeuser Hall contains the departments of psychology, physical therapy, occupational therapy, exercise science and neuroscience. Each of these five departments has their own unique teaching clinics, classrooms, laboratories and support spaces. Clinic patients wanted nearby parking and lower floor access to the building, while the main academic entry needed to reflect the pedestrian nature of the campus. This produced a building with two distinct entrances: one traditional and one more modern. To enable a modern building with large spaces to fit into a campus whose older buildings have a smaller, more intimate scale, the building was arranged in four bars. On the narrow side of each bar, window bays make the ends feel even more slender. “We managed to make the building seem smaller than it is, as seen from the heart of campus,” said Bohlin. Traditionally, Tudor Gothic buildings have small windows, dark interiors and long double-loaded corridors. Rather than a single long corridor at each end, Bohlin Cywinski Jackson separated the hallways in two sections, and added a window at the halfway point with a built-in bench for seating. Though it appears to be a Tudor Gothic building on the outside, the interior is distinctly modern. A four-story atrium with a large skylight above opens up to light and views. Students lounge and study on maple benches and settle into nooks of curved maple crescents and red walls. A grand stair winds up through the space connecting all floors. The west entry reflects the rich architectural context of the campus with a sandstone, brick and glass entry tower. Weyerhaeuser Hall is designed to meet or exceed LEED silver standards. It uses 71 percent less energy than the national average for college and university buildings. This was achieved in part by using geothermal heating: 32 miles of radiant tubes run under the floors. Much of the building has no air conditioning or mechanical ventilation; instead, strategically placed windows open to bring fresh air into the rooms and corridors. Low-tech heating and cooling strategies are used to achieve high energy efficiency. More than 200,000 bricks were made for the building in nearby Newcastle, and stone came from the Wilkeson quarry, just 25 miles from Tacoma. Using local bricks and stone is not only sustainable, it helps keep the craft traditions of construction alive. The concept of bringing so many different uses together in one building reflects a newer way of thinking in the health sciences, where collaboration and intercommunication across departments are encouraged. The university believes that this approach at Weyerhaeuser Hall is unique for an American liberal arts college. Tomorrow, Weyerhaeuser Hall will be dedicated. Students taking classes in the building this fall won’t know if people call the architecture modern or traditional. That’s fine with Bohlin. He knows one mustn’t always choose. Ray Calabro, AIA, is a principal with Bohlin Cywinski Jackson and served as principal in charge for Weyerhaeuser Hall. Matt Wittman, AIA, was project architect for Weyerhaeuser Hall. He has a diverse background in architecture, landscape design and studio art.